Injectables are substances injected into your body to soften facial lines, fill in depressions, highlight facial features, and now replace fat lost due to aging. There is a dizzying array of injectables available today. I can hardly keep up. The oldest and most widely known is collagen, immortalized by Goldie Hawn’s lips in the movie, “First Wives Club,” and collagen is still available. However, there are now newer and different substances that can provide even greater enhancement. We use Restylane, Juvéderm and Sculptra for fillers, and of course we use a lot of Botox!Fat transfers are a different process. Fat transfers are done using your OWN fat. The advantages are obvious. Rather than paying by the teaspoon, you can go by the pound. Your own fat is readily available, and is removed from any part of your body where you have extra fat, using a small cannula and then transferred to almost anywhere on your body you desire. The fat does stay where I put it, and it does last. I have performed well over a thousand of these fat transfers – it really is one of my favorite procedures. I have been performing this procedure since 2000, and know from personal experience that the grafts do last predictably. Since fat grafting is safe and reliable, and the fat remains in place and can last and last for years, what are the down sides? The bad news is fat grafting is a surgical – albeit minor – procedure done under local anesthesia like at the dentists’. It is associated with lots of swelling and bruising and lumps and bumps because the needle used to inject the fat is fairly large, and I have to make hundreds of passes to thread the fat in. Sort of like piping thin lines of frosting in a lattice pattern under the skin. Fat grafting is not a precision outliner like Restylane, Juvéderm or collagen, but more like adding stuffing to a Build-A-Bear stuffed animal. There are other advantages of fat grafting. Fat turns out to be an excellent source of stem cells. These are cells that can turn into any type of tissue. It has recently been discovered that human fat tissue has a higher concentration of adult stem cells than any other tissue in the body. In fact, adipose tissue contains more than 1000 times more stem cells with the same volume as bone marrow. 500 ml or about one pound of fat can yield approximately 200 million stem cells. The transplantation of these stem cells MAY be the reason fat grafting results see such clinical improvement by providing more blood supply, causing more collagen production and slowing facial skeletal atrophy. Under the eyes and around the cheekbones, fat grafts can be amazing. If you look under your eyes, the lower lids may have both bags, and also a valley or indention near your nose. This is called a tear trough. And like a trough, it creates a dark shadow under the eyes that is difficult to camouflage, and gives a gaunt, tired look. Filling in this trough, and then highlighting your cheek bones, can give not only your eyes but your entire face a refreshed look. See my results under eyelid lifts. 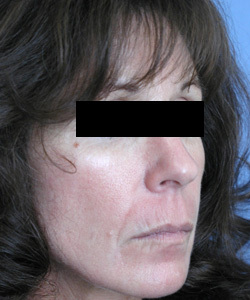 However, here are some results with only fat grafts, combined with other procedures – mini facelifts, Restylane, etc. Finally, fat grafting for breast enlargement is here. I was skeptical when the Brava Bra came out ten years ago, and I laughed at the concept that wearing plungers could help permanently increase breast size. But I am not laughing anymore. The plungers COMBINED with fat grafting can make a permanent change in size. They are basically an “external” tissue expander that resemble an Austin-Powers-fembot-contraption. The Brava Bra is worn for ten hours a night for a month before and after fat grafting surgery. By applying negative pressure, like a giant hickey, there is an increase in blood supply to the skin. The better the blood supply to the skin (or breast), the better the survival of fat grafts. In general, though, the amount of fat that can be successfully transferred in one session is still slight – about 250cc per session. Also one must have fat to donate to the cause, i.e., you must have fat elsewhere to transfer to the breast. Fat transfers to the face have been more reliable up until now, because 1) the face has a much better blood supply 2) the amount of fat is typically more like two to ten cc. Thirty cc is about once ounce, and everyone has about one extra ounce of fat! This sixty something year old was tired of looking tired. He really only had his lower eyelids done and some fat put into his cheeks (he operated on the mustache himself). But wow! It truly made him look ten years younger and way less tired. This 44 year old never smoked, but because of the dry climate in Colorado and her fair skin, showed signs of aging. Your face can lose volume, which makes your skin sag and causes wrinkles. Adding fat restores the lost volume just like adding stuffing. The Restylane was then placed into those stubborn wrinkles that are just pressed into your skin. The result is a refreshed, not pulled look.